Zero day! With Liz, Yay! Today was a full day of non-hiking. 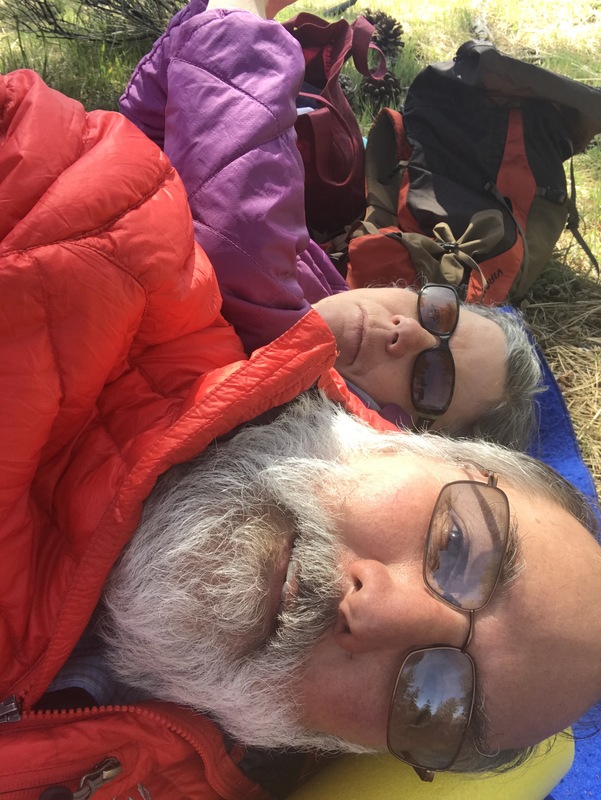 We slept in (relatively), grabbed a quick breakfast, Skyped with daughter Nicole in Berlin, then hit the road down the hill to the nearest REI in Rancho Cucamonga to return my failed Superfeet Shoe inserts (the PCT did then in!) and to get a Titanium cook pot to lighten my load. We also stopped at Trader Joe’s and Vons to get my food resupply. Lunch was At del Taco, which I have not had in soooo long. My combo burrito was as good as I remember it used to be. We drove up to the Pass where I resume and lazed around in the shade of pine trees. I was obsessing about my food situation: i arrived in Wrightwood, as I did in Big Bear, Idyllwild, and Julian with more than a day or two’s with of food. I decided that I need to make a more brutal food culling plan — I’ll not just pack all that comes in the packages I bought, but will I instead take a day less than I think I need. I’ll have Liz send the rest to my resupply place (Hiker Heaven (HH)) for next week. My food bag is now half as full, but I’ll bet I walk into HH with extra — just you watch!!! We ate calzone at the Mile High Pizzaria and Are settling down to bed. Liz will drive me up to the trail tomorrow morning and join me on a bit of the hike before the long drive back home. I hope to continue on to summit Mt Baden-Powel. It is supposed to be icy, so wish me luck!? Hi, we Renee and Dale! (He goes by DJ because he is a Dale Jr.), we started reading your blog a few days ago, and we’re hooked! Great writing and photos. We live in Tehachapi, so we see lots of hikers in the spring. Will you be stopping in Tehachapi? Hi Renee and DJ — I do need to resupply in Tehachapi or Mojave — I know little about either and so had no preference. I believe I’ll arrive in the area around May 5 or 6. Wow sounds great– I’ve been hungering for good BBQ! It looks like I will be arriving in Tehachapi on Thursday. I’m looking forward to the Red House BBQ! How wonderful that Liz met up with you. 🙂 We emailed a bit about the time you started your hike. I really enjoy following along through your blog. I love being able to see your pictures as I read about your hike. Take care and hopefully we’ll catch up soon! Dale, I started reading your blog when you were in Julian. It is excellent. I very much enjoy your commentary on the desert flora and fauna… especially the snakes and lizards. I know how hard it is to be a hiker-blogger. Keep up the good work and good luck with your hike! Thank you John! I’ve got some more posts to deliver when I arrive at Hiker Heaven later this week. I hope you enjoy them.